A widely cultivated, trailing succulent with sharply three-angled leaves, conspicuous flowers and edible fruits. It is used as a remedy for many ailments. 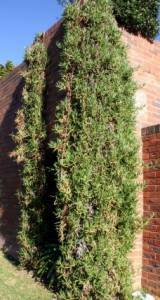 Carpobrotus dimidiatus is a robust, trailing plant with fleshy, green, three-sided leaves. 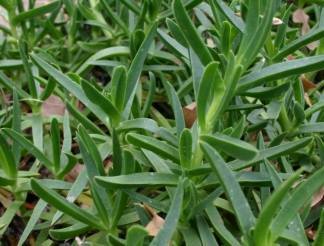 It may spread over large areas to form a tough ground cover resistant to drought and salt spray. The large, shiny, mauve vygie flowers are borne singly on more or less erect flowering branches. The base of the flowers is sharply 2-ridged. The top-shaped fruits have fleshy walls which eventually become dry and tough and never open. If one wants to get at the slimy, sourish pulp in which many small, brown, shiny seeds are embedded, one has to bite or cut the fruit open. The seeds are dispersed by animals which eat the fruits. This plant is found on sand dunes along the coast from the Eastern Cape northwards through KwaZulu-Natal to Mozambique. The name Carpobrotus is derived from the Greek carpo meaning fruit and brotos meaning edible; dimidiatus means halved or divided (Pooley 1998). For many years this plant has been used in the Eastern Cape as food and as a remedy for many ailments by the inhabitants of the region. Because of the sour taste of its fruit it became known as suurvy which refers to the taste of the fruit, or strandvy which means beach fig. 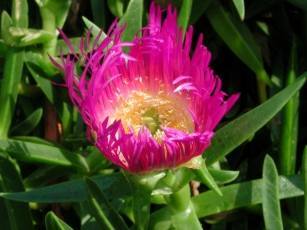 The genus Carpobrotus has six species in southern Africa, one with two subspecies. See Carpobrotus edulis for more about this genus. Its family, the Mesembryanthemaceae, one of the largest in southern Africa, comprises about 123 genera and 1680 species. Carpobrotus species are used extensively in many parts of the world to bind the soil on roadside cuttings and railway embankments, and they are grown against retaining walls constructed of plant blocks. The plants are also used as a remedy for a great number of ailments. The strained juice of the pounded leaf is used as a gargle for a sore throat and for thrush, for digestive troubles and as a treatment for diarrhoea and dysentery. 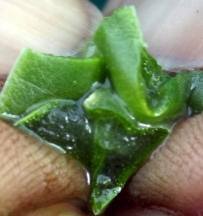 Cloths soaked in the leaf juice are used for dressing burns and sometimes an ointment is made by melting the juice. The fruit is sourish in taste and is eaten raw, preserved, dried or prepared as a jam. It also makes a first class syrup and is said to have a laxative effect. The plant is regarded as a good source of catechol tannin (Watt 1962). The KwaZulu-Natal National Botanical Garden every month sends 10-15 bags of this plant to organisations like CINDI ( Children in distress ) Lifeline and PADCA ( Pietermaritzburg & District Association for the Care of the Aged.) to help people with skin problems such as sores and rashes. This species is very easy to propagate from cuttings taken just below the nodes and planted directly into their permanent places and watered immediately. It will rapidly strike roots and form a dense but rather coarse ground cover. Plants seem to be able to thrive in any kind of soil, from sand to heavy clay. To encourage flowering, see that they get some water between autumn and spring, but they can be left dry for the rest of the year. Carpobrotus is not suitable for small gardens unless kept within bounds but it is ideal for large town or coastal gardens, or gardens on farms where space is not limited and where a quick and extensive ground cover is required which does not need much attention. Fox, F.W. & Norwood Young, M.E. 1982. Food from the veld, edible wild plants of southern Africa. Delta Books, Johannesburg. Joffe P. 2003. Creative gardening with indigenous plants. Briza Publications, Pretoria. Pooley, E. 1998. A field guide to the wild flowers of KwaZulu-Natal and the eastern region. Natal Flora Publications Trust, Durban. Smith, G.F., Chesselet, P., van Jaarsveld E.J., Hartmann, H., Hammer, S., van Wyk, B.-E., Burgoyne, P., Klak, C. & Kurzweil, H. 1998. Mesembs of the world. Briza Publications, Pretoria. Watt, J.M. & Breyer-Brandwijk, M.G. 1962. Medicinal and poisonous plants of Southern and Eastern Africa. E. & S. Livingstone Ltd., London.